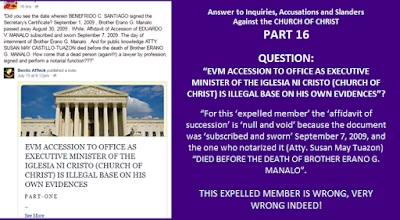 THE IGLESIA NI CRISTO: Is the "Affidavit of Succession" invalid making the ascession of Bro. EVM "illegal" as claim by the expelled members? 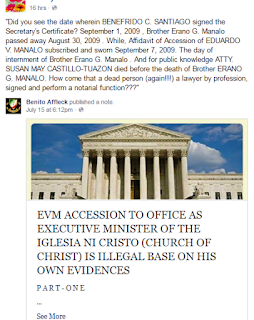 “EVM ACCESSION TO OFFICE AS EXECUTIVE MINISTER OF THE IGLESIA NI CRISTO (CHURCH OF CHRIST) IS ILLEGAL BASE ON HIS OWN EVIDENCES”? THIS EXPELLED MEMBER IS WRONG, VERY WRONG INDEED! 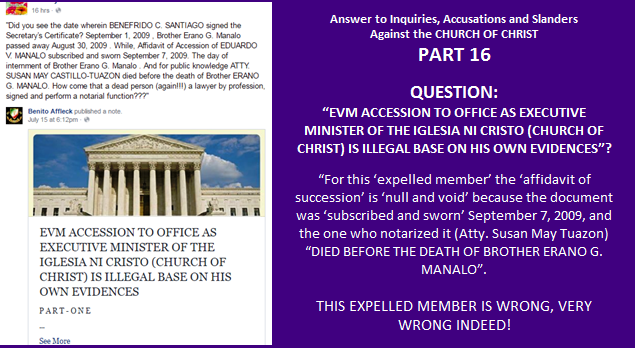 In their attempt to malign the CHURCH ADMINISTRATION, to malign BROTHER EDUARDO V. MANALO, they will do and use everything without first looking at facts. Who is Atty. Susan May Tuazon? She was the wife of Brother Larry Tuazon, a minister of the Iglesia Ni Cristo. She was also the former Corporate Secretary of New Era University, and she played a major role in the preparation of contracts and legal documents of the construction of the Philippine Arena. AND SHE DIED LAST DECEMBER, 2011. Let me repeat that, SHE DIED LAST DECEMBER, 2011. 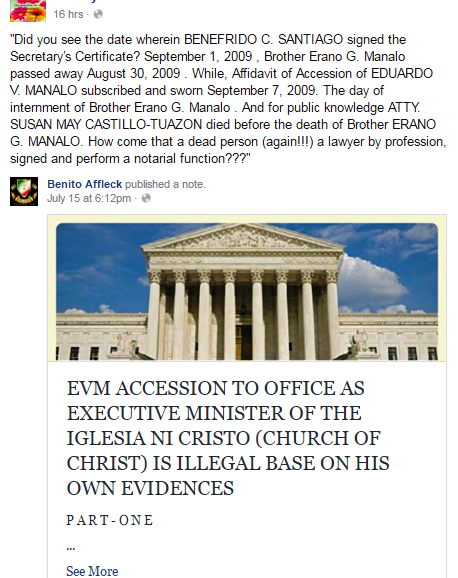 This was OVER TWO YEARS AFTER Brother Erano G. Manalo passed away and the notarization of said documents. THUS, YOUR ARGUMENT “Ms. SWINDLER and ILLEGAL RECRUITER” backfired on you. Just a piece of advice: look first at facts before you “bark” so you will not be buried in deep shame.